AweSome-Guitars.com: Product Reviews and News Releases. This page contains: Product Reviews, News Releases, Audio Clips, YouTube Videos and Advertising. 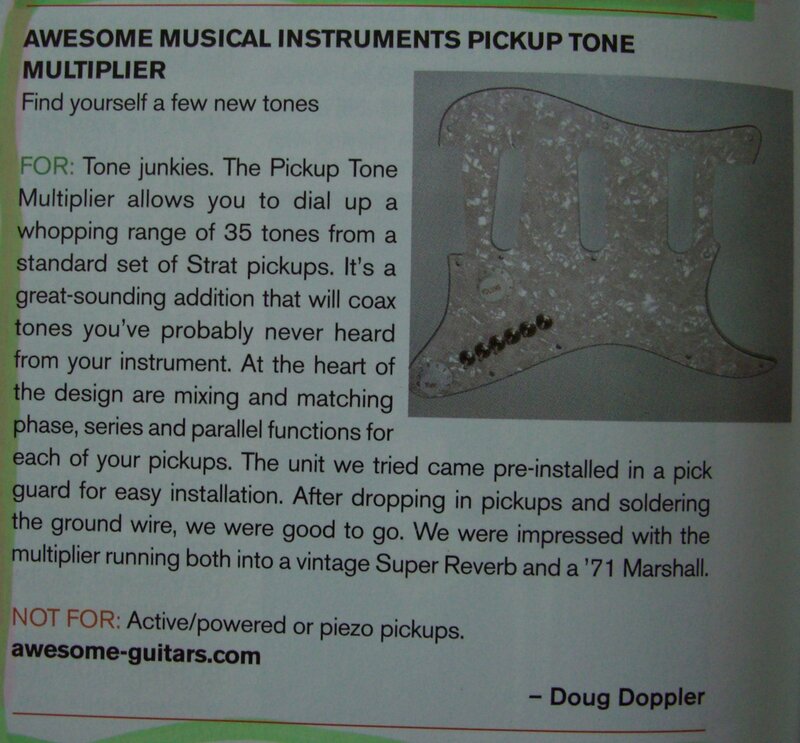 Endorsement: 4-Pickup Coil Telecaster Upgrade for 68 Pickup Tones (shawndavidanderson.com) You will need to scroll down to the bottom of the page to read the comments. You can also (click HERE to view the page image). Review: 4-Pickup Coil Telecaster Upgrade for 68 Pickup Tones (crazyaboutguitars.webs.com). If your trade magazine or website needs a previous release in Microsoft Word format with product photos, use our contact form at the bottom of the page for your request. Here are some AweSome product audio clips that demonstrate product use and the range of sound you can get from this High Performance T2-Switch Pickup Switch UpgradeTM product. Comment from a Repeat Customer: I now find the three available tone selections on my stock Tele instrument are very limiting after installing your upgrade. I still have the stock three sounds but the extra three sounds produced are distinct and useful. 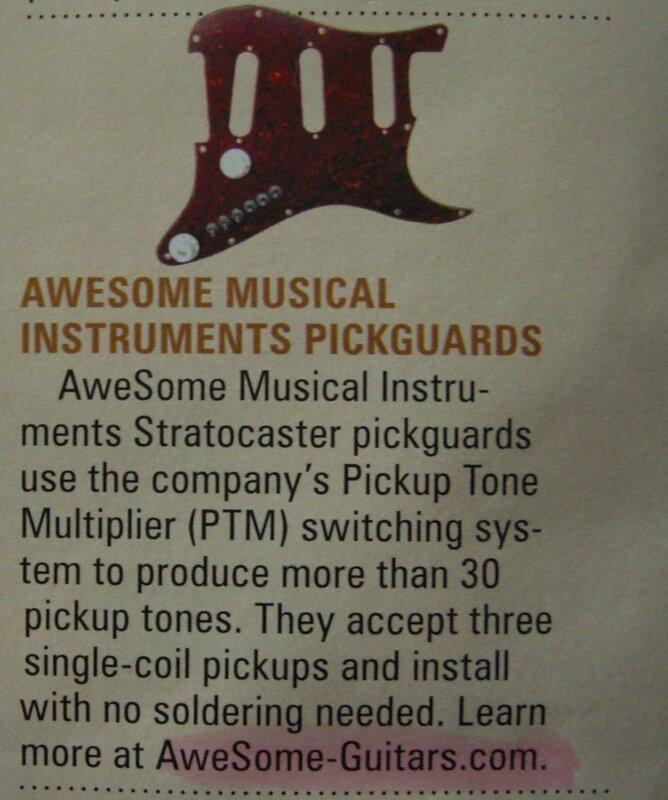 I love the setting that gives you both pickups in series (and in-phase). The result is a very strong but beautifully rounded jazz-like tone, something you would be struggling to get out of a standard instrument. Hearing that new intense country twang tone gave me goosebumps. Skimming through the documents that I downloaded showcases the awesome level of detail provided, certainly far more extensive than any other products that I have seen. Very well done!  Graham Mann (Australia). Review: 2-Pickup Coil Telecaster Control Plate with MP3 sound clips farther down the page (sharemyguitar.com) and also available separately below using the individual MP3 players. To hear all 35 pickup tones from a Stratocaster guitar with three single-coil pickups, CLICK HERE to Listen. To hear all 68 pickup tones from a Epiphone Les Paul Standard guitar with two 4-wire humbucker pickups, CLICK HERE to Listen. Here are some AweSome product videos that demonstrate product use and the range of sound you can get from this growing family of High Performance patented Pickup Switch UpgradeTM products. This Kingston (ON), Canada guitar builder outfitted his new Evolution archtop electric guitar with our T4-Switch product giving this jazz guitar a celestial range of 68 pickup tones. He said, "I'm a guitar builder in Kingston, Ontario. Just wanted to let you know how happy I am with your T4-Switch. I've fitted one of my recent archtops with it and boy, does it ever do the job. To see a YouTube video of Dave Barton putting this guitar to work, CLICK HERE. To see another guitarist, Brice Delage jamming on the same guitar CLICK HERE. See the following trade publications for AweSome advertisements.